Enjoy 20% discount on all jewellery at Gemondo this week. Find beautiful Mother's Day gifts and gorgeous gemstone treats and save when you use the discount code SPRING during checkout. Offer condition: Offer ends 31/3/2019 at 23.59pm GMT. Only valid on jewellery items available at www.gemondo.com, us.gemondo.com, www.gemondo.ie and www.gemondo.com.au. Cannot be used in conjunction with other offers. Please visit Gemondo.com for full terms and conditions. Do not miss another Gemondo Jewellery voucher! 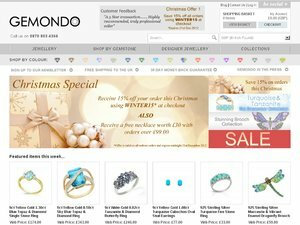 Simply leave your e-mail address and we'll always keep you informed of new vouchers for Gemondo Jewellery. A treat for lovers of vintage style. Enjoy 20% discount on Art Deco inspired, Art Nouveau inspired, Rennie Mackintosh inspired and Lockets collections at Gemondo jewellery. Offer condition: Offer begins on 28/2/2019 at 00.1am and ends 3/3/2019 at 23.59pm GMT. Cannot be used in conjunction with any other offers. Only valid on selected items available at www.gemondo.com. Please visit Gemondo for full terms and conditions. Offer condition: Only valid on purchases made at Gemondo. Offer must end 18th December 2018 at 23.59pm. Cannot be used in conjunction with other offers. Gemondo reserve the right to cancel any promotion at any time. For full terms please visit www.gemondo.com. Take advantage of 20% discount on all earrings at Gemondo jewellery. Take advantage of 20% discount on all matching jewellery sets at Gemondo. Offer condition: Offer must end on 4/12/2018 at 23.59pm GMT. Cannot be used in conjunction with any other offers. Gemondo reserve the right to cease any promotion at any time. For full terms please visit Gemondo website and see AWIN profile. Take 30% discount on all jewellery (excluding sale items) with the code BLACKFRIDAY18 until 27/11/2018. Shop a selection of beautiful jewellery collections with this special discount. Offer condition: Excludes sale items. Offer must end on 27/11/2018 at 23.59pm GMT. Cannot be used in conjunction with other offers. For full terms please visit website. Choose from Gemondo's selection of romantic 9ct rose gold and rose gold plated sterling silver jewellery and take 20% discount when using the promotion code ROSE20. Enjoy 20% discount on the birthstone of September when using the code sapphire20 on any sapphire jewellery available at Gemondo.com. Offer condition: Offer begins on the 10th September 2018 at 00.01am and ends at 23.59pm on the 16th September 2018 GMT. Offer only valid on selected items available at www.gemondo.com www.gemondo.ie us.gemondo.com and gemondo.com.au. Cannot be used in conjunction with other offers. Please visit Gemondo online for full promotion terms. The Gemondo Summer Sale continues with up to 40% discount on beautiful genuine gemstone rings, earrings, necklaces and more. For a limited time customers can enjoy an extra 20% discount on all sale jewellery at Gemondo with the voucher code SALE20. This offer must end on the 31st August 2018. Offer condition: Offer begins on the 20/8/2018 at 00.01am and ends on the 31/8/2018 at 23.59pm GMT. Only valid on selected items purchased from www.gemondo.com, www.gemondo.ie, us.gemondo.com and www.gemondo.com.au . Cannot be used in conjunction with any other voucher codes. For full terms please visit www.gemondo.com. Customers can enjoy an extra 10% discount on already discounted sale jewellery when using the voucher code SALETEN before midnight on the 31st July 2018. Discover a wide range of colourful and genuine gemstone rings, earrings, necklaces and more in hallmarked gold and sterling silver designs at Gemondo. Offer condition: Offer only valid on sale items available at www.gemondo.com, www.gemondo.ie, us.gemondo.com and www.gemondo.com.au. Offer begins at 00.01am on the 23rd July 2018 and ends at 23.59pm on the 31st July 2018 (GMT). Cannot be used in conjunction with any other offers. For full terms please visit us. Enjoy 20% discount on site wide at Gemondo jewellery over the May bank holiday weekend with the code BH2018. Offer condition: Offer begins on the 25/5/2018 at 00.01am and ends on the 28/5/2018 at 23.59pm GMT. Cannot be exchanged for cash or equivalent. Cannot be used in conjunction with other offers. Only valid on selected items purchased from www.gemondo.com. For full terms please visit www.gemondo.com. Offer condition: Offer begins on the 4/5/2018 at 00.01am and ends on the 7/5/2018 at 23.59pm GMT. Cannot be exchanged for cash or equivalent. Only valid on selected items purchased from www.gemondo.com. For full terms please visit www.gemondo.com. We're offering our customers a payday treat for jewellery lovers. Use the code PAYDAY on eligible full price items to redeem 20% discount on your total until the 4th February. This offer excludes sale items. Offer condition: Payday offer begins on the 29/01/2018 at 00.01am and ends on the 4/2/2018 at 23.59pm GMT. This offer excludes sale items. Discount code must be presented during checkout. Cannot be exchanged for cash or equivalent. Only valid on items purchased from www.gemondo.com. For full terms please visit www.gemondo.com. Enjoy an extra 20% discount on already discounted Gemondo Sale gems when using the code SALE until midnight on the 31st January 2018. Offer condition: Promotion must begin on the 22/1/2018 at 00.01am and end at 23.59pm GMT on the 31/1/2018. Offer is only available on eligible Sale items available at www.gemondo.com. Discount code must be presented during checkout. Cannot be exchanged for cash or equivalent. Only valid on selected items purchased at www.gemondo.com. For full terms visit www.gemondo.com. Enjoy 10% discount when you spend £100 or more this weekend. Use the code HOORAY during checkout. On the 22nd November Gemondo's Black Friday 2017 promotion for all customers begins. Shoppers can enjoy 30% discount on all jewellery (excluding Sale items) when using the promotion code BLACKFRIDAY. Offer condition: This offer must end on the 26th November at 23.59pm and is only valid on orders at www.gemondo.com. Terms apply. See website for details. Latest voucher code valid at a time of promo publication was entered to be working from 2019-03-25.